Accidents and disasters are rising at an alarming rate in the recent times most of which are caused by sheer human carelessness and follies. When an avoidable disaster breaks taking a huge toll of innocent human lives, it can hardly be compensated for by any sort of post-operative measures. Series of fatal road crashes coupled with fire accidents have virtually taken the whole country by the storm. Traditionally dubbed as a naturally disaster-prone country, the recent occurrences have clearly earned a new label of being disasters of human carelessness and mismanagement. Our concerns reach the peak when they occur just because of the sheer inadequacy of and in many cases absence of precautionary measures. The management of all state affairs and the smooth functioning of all departments are being seriously threatened due to mono-centric organogram of the state. And this unipolar state framework virtually happens to be the Achilles’ heels contributing hugely to the recent human disasters like fire accidents and road mishaps. There can be no smooth management through cramming and congestion. Cramming and congestion are caused basically by frantic rush towards one-centre. In a one-city-based administrative structure, all facilities and opportunities are concentrated round one particular centre which is why streams of people from across the country are rushing towards that centre for seeking fortunes and churning the pool of opportunities floating surrounding the centre. As an inevitable part of this endless process of urban-mania, a sort of frantic competition among the fortune-seeking new-comers leads the capital towards an unmanageable and uncontrollable pandemonium. 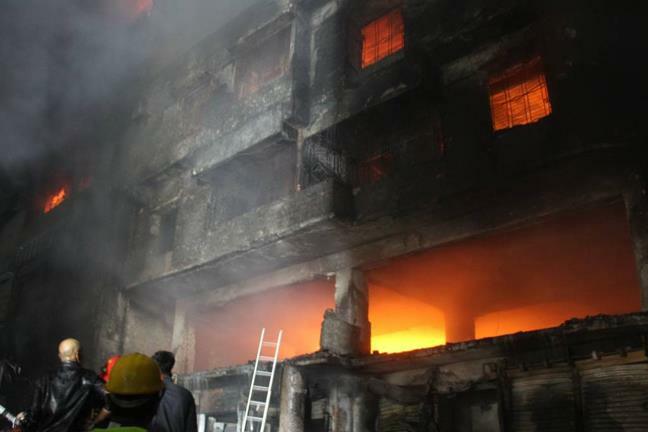 Occurrence of fire incidents in quick succession happens to be the spin-off effects of this overcrowding phenomenon rather than an isolated phenomenon. Stockpiling of all facilities within the administrative boundary of just a single city can hardly be found anywhere across the globe. Even in our neighbouring countries, state facilities have been scattered through more than one city even though facilities are not equally distributed. For example, in Nepal and Bhutan, state-sponsored facilities and opportunities like jobs and employment are not attached to only one city. Moreover, vital installations and important public offices are crammed into the capital. That is why these countries civil casualties rate has always been to the minimal level. In a vastly large country we also see the process of decentralisation has always been in effect in practical transaction. Even in Europe and America, state-sponsored opportunities are distributed among the cities and people do not feel the irresistible urge to head for a particular city like one in Bangladesh. India is actually an ideal case in point here. The model of Indian administrative set-up is really praiseworthy. Mega cities have been patterned in such a way that the rush of the periphery people is not at all towards a single city. For instance, Bengaluru has been developed specifically as a city of medical facilities. Similarly, Mumbai has been developed as India’s commercial heart. In the similar fashion Mega city Kolkata has come to be known as a city of pleasant shopping. India hasn’t crammed all state-owned establishments in New Delhi. The most striking feature common to all these cities is that those more or less contain the essential modern facilities required by the people. The capitals of almost all countries of the world other than Dhaka have not been developed as the focal point for receiving all facilities and services. This sort of patterning happens to be the main characteristic feature that makes all the difference between Dhaka and the rest vital global cities. Even more, we will see that Malaysia has developed Putrayajaya as the planned city and has been used as the federal administrative capital of Malaysia. In Malaysia, India, Canada, the USA, the UK central or the federal capital serve the specific ends of federation which is why the rush towards the federal capital is quite manageable. Time is fast running out for Bangladesh for doing practical ground works to build planned cities and relocation of vital public installations. To ease the crammed capital of Bangladesh, it is time to opt for federal system of administrative decentralisation in the most suitable set-up. It is already too late for us to make a breakthrough in administrative decentralisation. I strongly believe that the only option left for this over-populated country is to go all-out for re-distribution of facilities and services which have been over-packed in and around Dhaka. Dhaka has already become a city of jam and cramming. Now it tends to become the city of accidents and all these negative phenomena have been added to Dhaka virtually because of its being an over-populous city. The people of Bangladesh have no other option but to move to Dhaka since there are no other parallel cities in the country with facilities of living and essential requirements. The best possible way to get a safe exit out of this chaotic pandemonium is to decentralise our administrative infrastructure to the divisional cities where adequate opportunities for living and employment will be available. People move to those cities that offer them opportunities for livelihood as well as ensure solution to all matters related to life. All divisional cities have to be immediately declared as provinces with necessary and effectively operable administrative infrastructures and opportunities. The greatest hurdle in the way is obviously the deep-rooted and strongest syndicate of Dhaka-based power elite. The whole of Bangladesh has to be at one on this one-point demand to save Bangladesh through initiating the decentralisation process without any further delay. Whether we accept or deny decentralisation, it is a fact that only decentralised governance system can ensure smooth management and can provide the best antidote against all untoward and avoidable accidents and tragedies.